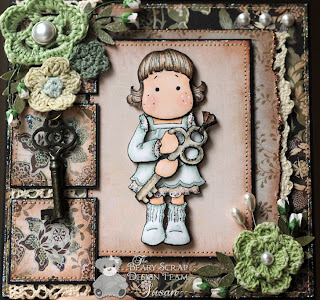 It's Susan Monday over at The Beary Scrap Design Team blog, which really means I get to introduce the design team's weekly theme. This week we all worked with a sketch that we'll use as our next Beary Sweet Challenge on Friday. Be sure to check back for a great sketch! 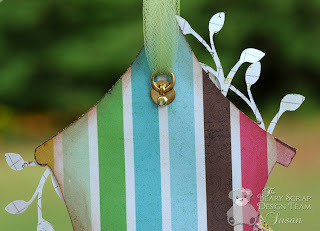 I love the Basic Grey Capella papers.They're such wonderful prints and warm colors! I complemented the BG with Bazzill Basics in Mud Pie, and actually veered away from my normal white card stock base. (You'll see another here Friday.) I do like the "drama" of an all-dark base! 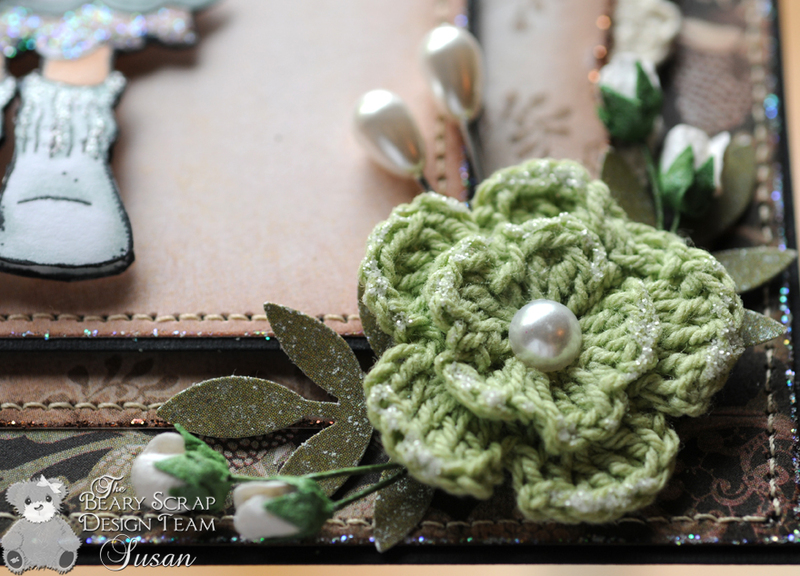 As embellishments, I sprayed all the crocheted flowers, rose buds and leaves with pearl Glimmer Mist - it's a lovely subtle sheen. 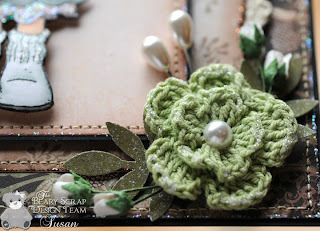 The green flower in the bottom right is edged with Frosted Ice Stickles for a little added (but still subtle) bling. Hmm... can bling be subtle? Anyway... I received a card from the oh-so-lovely and talented Elise of Paper Love Affair the other day and was WOW'd by her perfect Stickles edging. 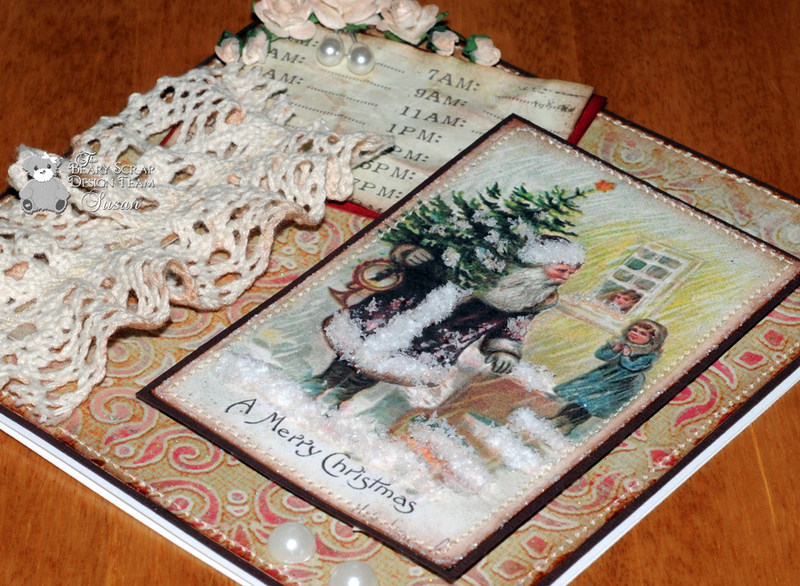 I was so inspired to try it on this card... not perfectly straight, but better than any effort before today. Thanks sweets! Our sketch has a rough -or torn- edge, and I ran a little bead of water down the edge of the paper with a Brush2O, let it soak in a bit and tore the edges off. Once dry I edged with Cinnamon Stickles and layered with a bit of scrap crocheted lace. Creative Card Crew (10/11): Bloomin' Marvelous! Thanks for stopping in today! Don't forget you still have a few days to whip up a little creative somethin' somethin' for our Vintage themed Beary Sweet Challenge. You could win a $20 gift voucher to The Beary Scrap! 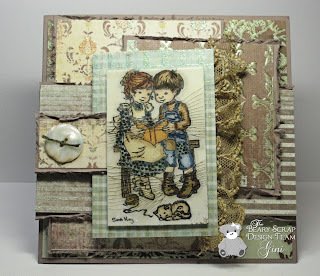 Beary Sweet Challenge #10: Vintage - Ends 9/30 - Come Join Us! Here is how the design team interpreted the vintage theme - click on the photos to go directly to each post for loads of details! Remember, this challenge ends Thursday, September 30 at 11:59pm (EDT) *and* we'll have a new sketch challenge up on the 1st. Thanks for visiting, and we hope to see *you* in our challenges, too! You could win a $20 gift voucher (with free shipping!) to The Beary Scrap. How cool is that? 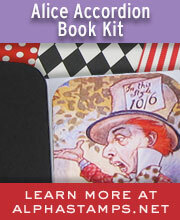 Copic Sketch Sale and X-Press It and Free Shipping... Oh My! Great news at The Beary Scrap! There's whole new batch of Copic Sketch Markers in stock and ON SALE for $4.89. Wow! Copic X-Press It Blending Card in stock and ready for your new markers! Oh, and there's one more thing I have to tell you. I just received my My Mind's Eye order and OMGosh! It's really luscious paper and I can't wait to work with it. All the MME lines are on sale at least 10%! So, happy shopping! I'm off to work on next week's card! TBS DT: We're In Great Shape! As you know, the design team has a new challenge every week to help introduce products available at The Beary Scrap. 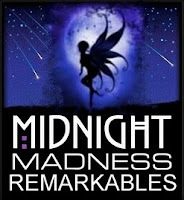 We do this in addition to our twice-monthly Beary Sweet Challenge - open to everyone on the 1st and 15th of every month. 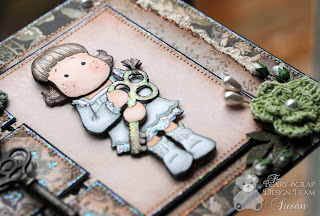 Our current BSC is a Vintage theme - check out our posting for all the info and some easy vintage suggestions in case you need 'em to play along. We hope you can join us before the 30th! Ok, so this week the DT is experimenting with shapes. We challenged each other to make projects that are anything other than the standard square or rectangle. I've had bird houses on the brain lately, and wanted to make a bird house card... major failure. 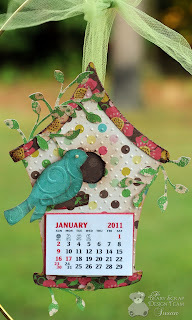 HOWEVER, I've also been noodling the idea to update a stocking stuffer calendar I made last year for a craft fair. Since I have my 2011 calendars on hand, now is the perfect time to play around with design, right? This is both very simple and very fun, especially with Echo Park's whimsical Life is Good. I dusted off my Cricut and used 2 cartridges - "Stretch Your Imagination" for the bird house and "Storybook" for the birdie and leaves. A little FYI to the Cricut folks - I cut the regular-sized bird house and it's layers at 5.5" (I have the original Cricut, hence the dust...), but I made my own template to make it a little longer. Both the birdie and branches are cut at 2". Here's a rear view. This striped paper is a separate layer that allowed me to sandwich the branch ends. Even though the calendar will hang on someone's cubicle wall or refrigerator, I wanted it to look "finished" on the back (and you can see the bow in this photo, too). I like how this turned out, although I definitely consider it a "prototype" that needs a few tweaks. Here's a link to the original calendar stocking stuffer, in case you're interested. It's one of a bunch of designs sold at the craft show last year. 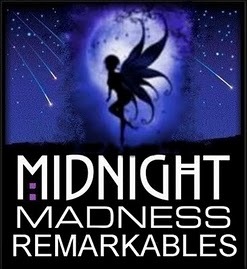 Creative Prompts #30 (9/30): Mark It On The Calendar! Pixie Dust Studio #40 (9/22): Fur or Feathers? I'm very honored. Thanks so much MMSC DT! Hello hello! I hope you had a great weekend. the Husband and I took a little road trip on Saturday and hid indoors Sunday for the first rainy day in ages. It was nice to wake up to the sound of soft rain - especially since it was falling straight down and not into any of the windows left open overnight. Temps were in the 50's, so after Finnegan went out for a quick wee, we all snuggled tighter under the covers and slept in. I love the cooler temps paired with cozy blankies and warm snuggly bodies in the bed... have I mentioned that our dog sleeps under the covers? He curls his 95lbs up at our feet every night. It's cute! Ok, so *I* decided to take the design team down this path kicking and screaming. I had to duck from a few well-thrown old shoes... but I'm still excited to see what they come up with when truly challenged! Here's another in my Vintage Christmas Series. Haha! I just made that up as an excuse for my 2 Christmas cards in a row here at TBS. I'm on a mission to avoid the Great Frenzy of 2009, which had me scrambling and working through the night weeks before a craft show. Oh, it was awful even for this procrastinator. 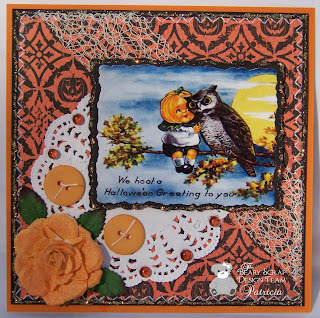 So, about this card: I used the yummy delicious My Minds Eye Laundry Line/Flirty Collection. The design is called "Pretty Coat" and boy is it fabulous! The tag in the upper left corner is also MME and available at the store. On my vintage postcard image I've added white Flower Soft for snow and as decoration on Santa's coat. 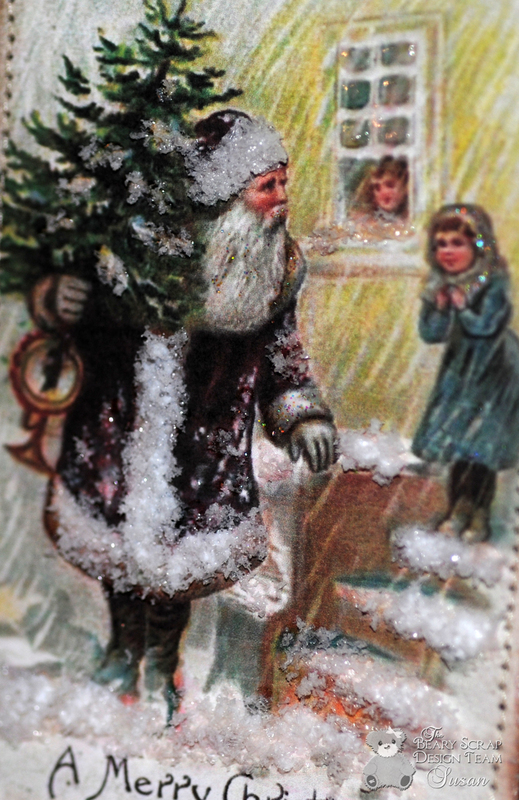 Star Dust Stickles found its way on the little girl's coat and the star, and Frosted Ice around the edges. The MME tag was trimmed and crushed into a ball, then the edges and random creased were inked up before it got a Pearl Glimmer Mist squirt. The flowers were white before being misted with Vanilla Glimmer Mist. I'm really pleased with the subtle color! Bah! Humbug! #35 (9/16): Favorite medium - Stickles, of course! Thanks for stopping in today. Don't forget that the Beary Sweet Challenge #9 is open until Tuesday night - there's still time to whip something up with our sketch! Hello hello! 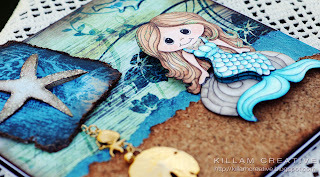 I'm so thrilled to be a guest designer for Digital Delights today! Thanks so much to the Delightful Challenges design team for picking my card as your favorite. I *know* there were a ton of fabulous entries and that the choice was a challenging one. Sooo, I've been itching to color a mermaid lately. I found this fabby Creative Imaginations paper at a little craft store a couple of months ago, just hoping a mermaid would swim on by and claim it. *wink* There are so many wonderful mermaid examples in the digi and stamp world right now, but not a single one as cute as this little darling. I'm *so* happy I waited! Isn't she the best? 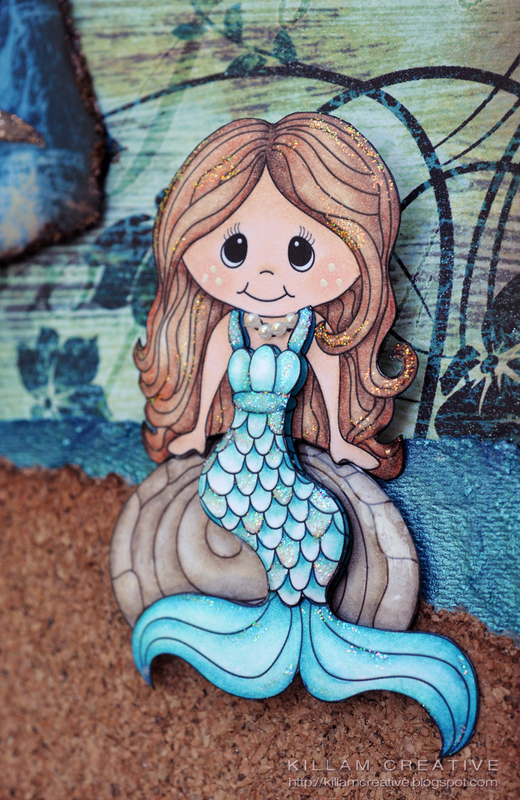 I've done my customary layering - this sweetie's full body layer (1) sits on a wet, glossy rock (layer 2), and her glittery scale-y dress is the third layer. It's a fabulous effect on this otherwise "simple" card. The starfish embellishment in the top left corner is cut from coordinating paper of the same CI line. I layered that, too, just 'cause I could. The charms are a combination of a sand dollar I bought as a teen (the matching chain is looong gone) and fun little gems from Sky Blue Pink. The chain is a necklace extender from a Grandma stash. Hey, it works! 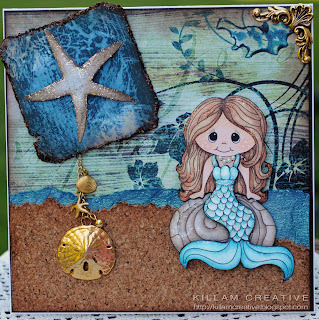 I used a wildly textured paper for the water and cork paper for the sand. Feel the grains between your toes? No? That's the beauty of cork sand! All the fun without the... grit. Aaanyway... this CI paper has such character that I couldn't cover it up too much. Inside, the printed "By the Sea" is from the same 12x12 sheet as the front section (I separated it and added the glitter, of course). This was one versatile sheet o' paper! Thanks for visiting! If you came by from Digital Delights - welcome! I would love for you to pull up a chair and sit a while (or, "follow" in blog-speak). I can tell you I write a lot - as if you couldn't tell by now - but I just might make you giggle in the process. I get immense pleasure from 'the making' and 'the writing about', and to know someone is actually reading sends me in a tizzy as if I was 10 and being tickled by *all* my older siblings. 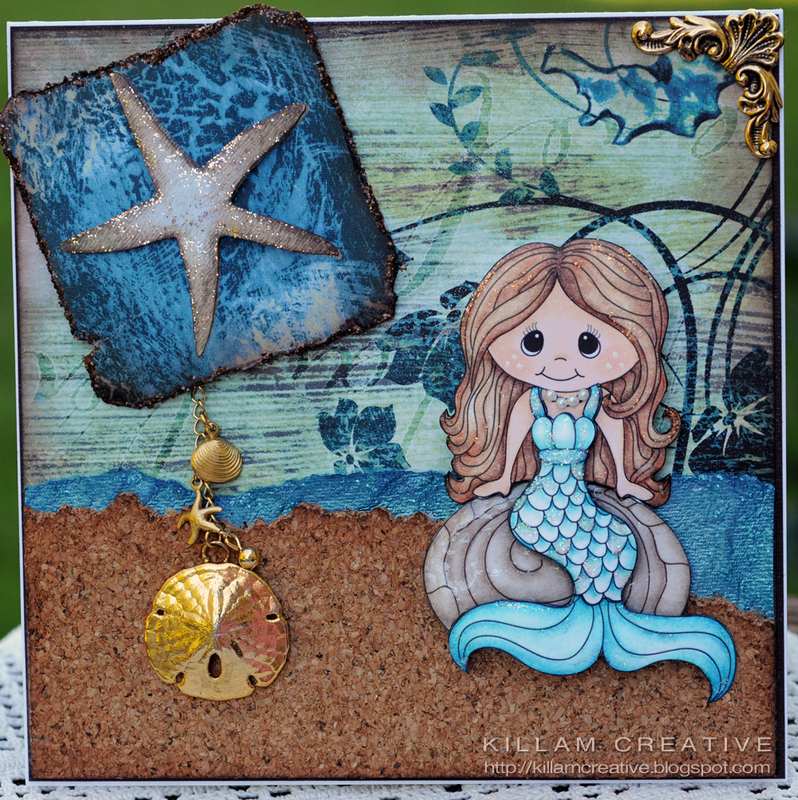 Paper: Creative Imaginations/ Christine Adolph's Tidepool Collection; Bazzill Basics in Mud Pie; Neenah Classic Crest for the mermaid; No idea about the blue textured paper or the cork (they're been in my stash for years) -- maybe from a Joann's Superstore? Embellishments: Charms I've already explained... :) ;corner metal from an ebay seller called Accent Factory - this was my last one, so don't buy them out before I get there *grin*; Pearl necklace bits from an unidentified stash; Inside pearls are Kaisercraft Latte. What is CDAC, you ask? Well, the Crafters Digital Art Center is a wonderfully well-organized community of digital artists and crafters, together to share products and projects and support one another. It is possibly the best gathering place for digital stamp users online. Really! 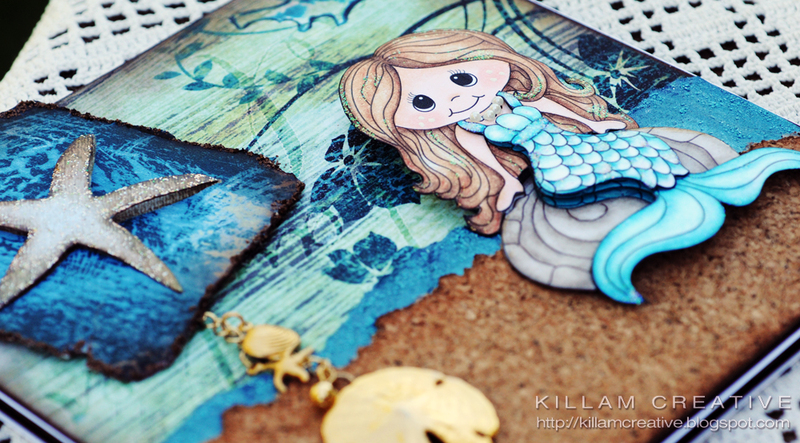 If you are a digi stamp artist or someone who does a lot of photo editing you will be interested in this giveaway. 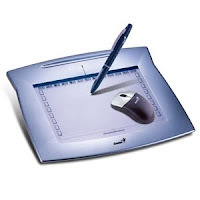 It's an amazing 8"x6" graphic tablet that allows you to abandon your mouse and use a pen instead. It's just like writing on a piece of paper, and the pen has buttons that mimic the left and right buttons on your very own mouse. Plus, it comes with a wireless mouse, too. Come on over to CDAC and enter to win (scroll down the page a bit for all the info) - you won't regret it! Hurry - it ends 9/13! My "plus one" is green. :) Ok, so here's the scoop - the delicious SEI Windsor gold and ivory paper and Kaisercraft wood die-cut are available at the store. As of this writing, I don't think it's on the website yet, so give Kimm a call to add to your order. Kaisercraft Wood Flourishes are raw wood and ready for your finishing. 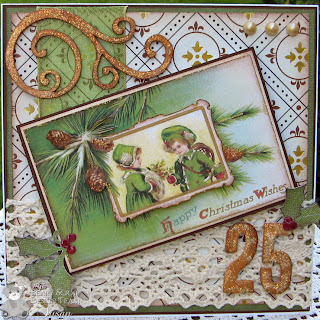 I painted this flourish gold, used dark brown chalk ink to age it a bit, then layered with Diamond Stickles. Remember a few weeks back when I waxed on about my white Stickles exploration (every white is different!)? Well, the gold flecks in Diamond Stickles were perfect for this project. The shine is more subtle than gold glitter and really tasteful... if glitter glue can be "tasteful". 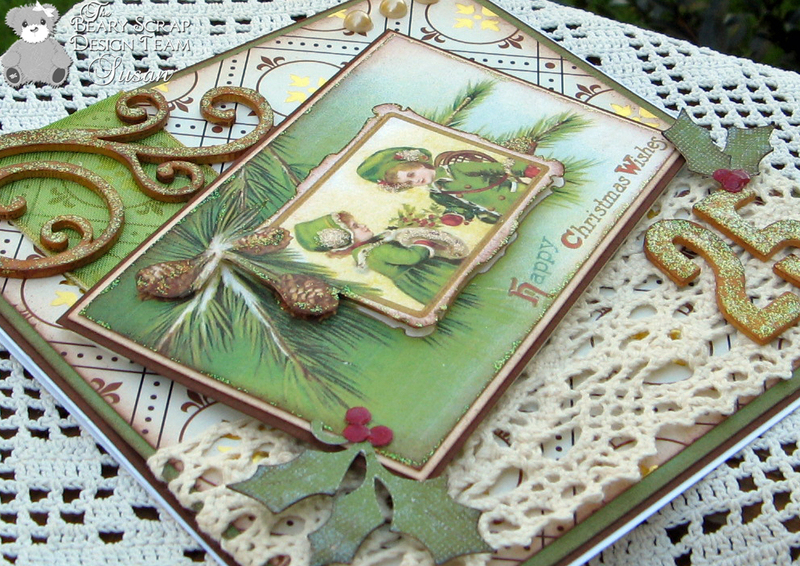 The holly sprigs are leftovers from last year's Christmas cards - I don't throw anything away! I think they were cut on the Cricut. 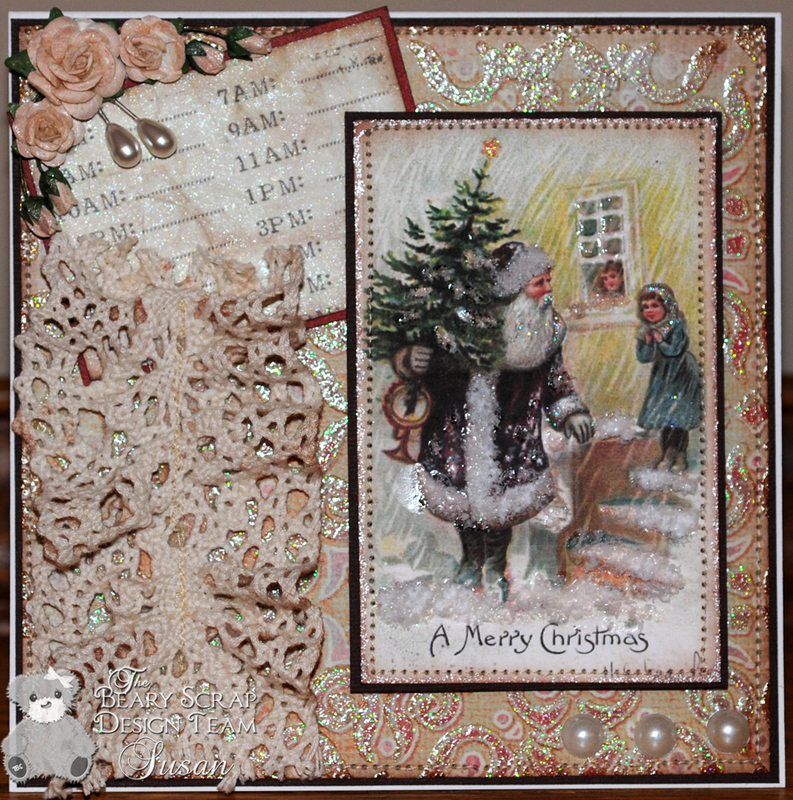 Embellishments: Kaisercraft Wood Flourishes (available at the store); Kaisercraft Pearls; sheer ribbon, lace, holly die cuts and numbers all from stash. Thanks for stopping in to visit today! Our Beary Sweet Sketch Challenge #9 is going on through the 14th - we'd love to have you join in! Hello hello! Ooh, it's the first of the month and you know what that means, right? Isn't she beautiful? 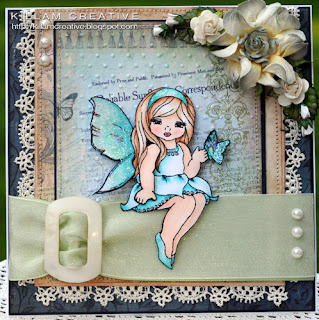 Make sure you bop on over to the CLP Challenge Blog and check out all the DT samples - you'll get a great view of the other Blossom Fairies and an adorable Gurlee Girl witch. I *so* need that one! Cammy is made from two layers - the wings, right arm and little butterfly make up the second layer. 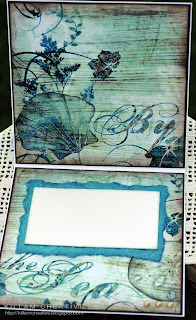 I've used papers from a 7 Gypsies "Nottinghill" 6x6 pack. Delicious! The papers are a little lighter weight than I expected, but they worked out perfectly. The large ribbon that Cammy is sitting on is ivory sheer over green satin. The buckle thingy is a vintage piece from a flea market find. I think it might be mother-of-pearl, but I'm not sure. I think it needs a little more embellishment... maybe a strip of lace over the sheer. So, I forgot to include a vertical panel from the sketch. Sorry Chelsea! Since I struggle horribly with sentiments of any kind, I replaced the sentiment on the top with flowers and moved them to the right to balance the buckle thingy. 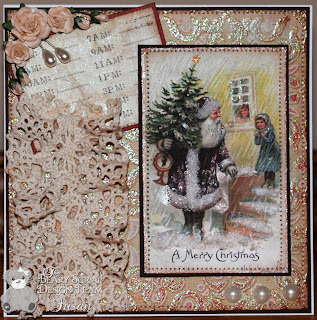 Paper - Bazzill Basics; 7 Gypsies "Nottinghill"
The challenge is sponsored by Gurlee Girl - go check out the store and see what *you* could buy with your $20 gift voucher! 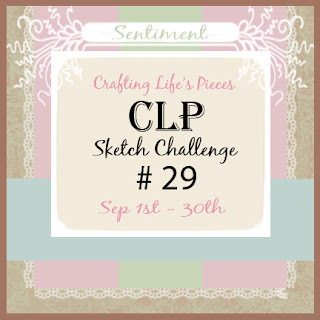 Here's the CLP #29 fine print: Make a project with this fabby sketch, upload by 9/30 and link back to CLP in your blog post. How's that for easy? I hope to see you there!